As you've probably read a hundred times or more, Washington, DC is the country’s new culinary darling. While our city is earning some well-deserved praise for being home to some of the best dinner spots in the nation, let’s not forget that you’ve got at least one other meal to look forward to each day before you can sit down to a bite at Bad Saint or Rose’s Luxury… if you can get a table at either. 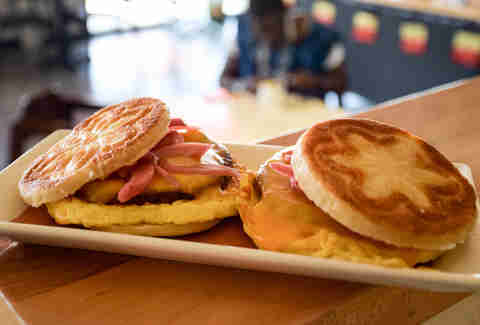 After several weeks of painstakingly difficult research and field tests, we’ve put together a roundup of DC’s best breakfast sandwiches, ranked in order of excellence. After all, what have we always said is the most important thing? 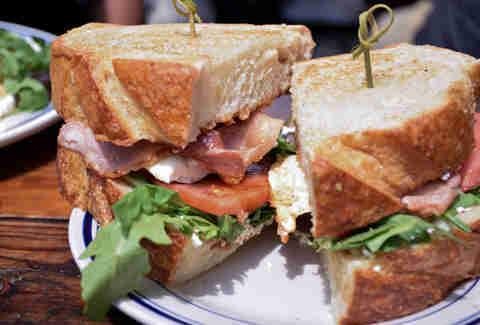 Though Duke’s is best known for its Proper Burger, the Sarnie is definitely worth a try. It is gargantuan. Of all the sandwiches we tried, it was easily the largest -- a massive brute, comprised of thick sourdough bread, rashers, arugula, and egg smothered in HP brown sauce, capturing all the flavors of the full English breakfast in a (relatively) smaller vessel. This one's definitely not for the faint of heart. While the places and storefronts of Old DC are slowly disappearing in Shaw, the Florida Avenue Grill remains, serving old-timers and newcomers to the community alike. This neighborhood institution has been cooking up delicious, no-frills food for over 70 years, doing right by everyone who walks in through its doors. The egg sandwich is served on toasted white bread, with a perfectly cooked and slightly charred halfsmoke sausage cut lengthwise, eggs cooked to order, and a couple slices of cheese. All in all, it has enough flavor to stand up to any of the more gourmet entries on this list, and is proof positive that we’ve had good food in the District way before all the attention. Super-thick Stoltzfus bacon, chive cream cheese, and pepper jelly are the stars of this contender's first few bites, their flavors marrying surprisingly well. The bacon is thick, perfectly salted, and delicious; the egg frittata has a fluffy texture that helps it stand out from the competition, and serves as a nod to the sandwich’s heritage -- RIP Blind Dog Cafe. This sandwich is served on a Bullfrog everything bagel, arguably one the best bagels in town, but we'd recommend requesting a toasted bagel here. Oh, and there’s lettuce and tomato on this bad boy, but they’re really just there to help you feel better about eating this decadent sandwich so early in the day. The mad geniuses at Union Market’s Buffalo & Bergen named this one well: the combination of fried egg, fresh mozzarella, sopressata, and pesto is a major flavor bomb, and the pesto is perfect -- so fresh and richly textured. The sopressata is salty and fatty, which balances out the richness of the mozzarella and egg. 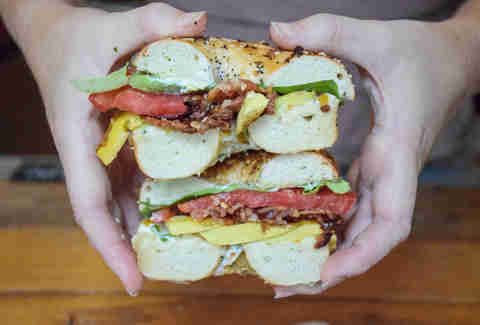 It’s a messy, runny, and delightful hangover cure -- get it on an everything bagel to take it up a notch. Courtesy of Mason Dixie Biscuit Co. There's simply no way to eat this elegantly, but once you bite in, you will not care. 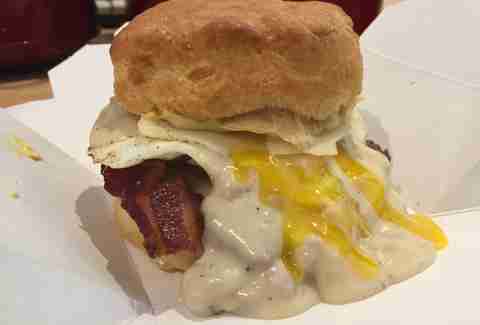 The biscuit is fluffy, buttery, and rich, without ever feeling heavy, even though it’s all smothered in a heaping serving of sausage gravy. The bacon is smoky, crispy, and peppery, and comes topped with a fried egg and aioli. This guy may be small, but it packs a punch. This sandwich is super flavorful and filling -- and totally vegetarian. 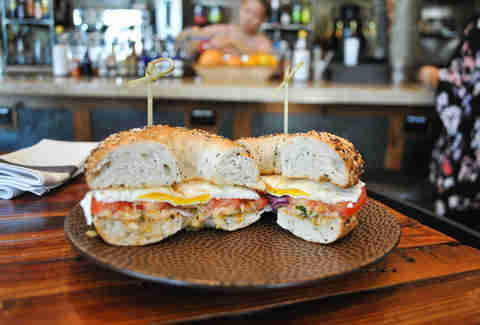 A Firehook Bakery bagel gets topped with a fried egg, tomato, red onion, and the house-made royal cheese spread, which is made up of cream cheese, pepper jack cheese, and peppers, and adds a smoky, spicy element. The bagel comes nicely toasted, which in addition to the crisp red onion creates a pleasant crunch and textural mash-up with the other ingredients. 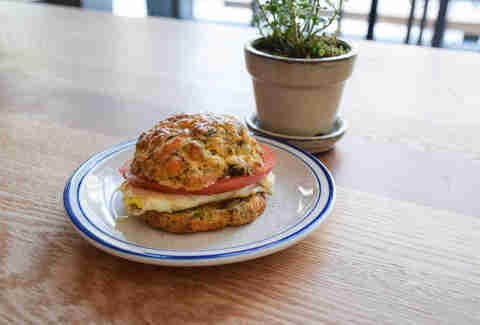 Crunchy on the outside, fluffy inside, this perfect biscuit has spicy sausage and cilantro baked into it, but manages to avoid being too salty or overwhelmingly herbaceous. It's served with an organic fried egg, a dab of mayonnaise, and a thick slice of tomato, which is a nice cool change of texture on the inside. The egg is just a shade harder than the usual -- a firm yolk -- without being dry. Really flavorful, and a smart update to a breakfast staple. The light hint of sweetness of the tigelle -- a disc-shaped flatbread baked in a press until golden-crisp -- is complemented by the smokiness and anise in the house-made chorizo patty. Balance these out with cheddar, pickled onion, and sour cream, and this sandwich stands out: the onions cut across the creamy texture of the melted cheddar and sour cream, and play with your taste buds. It's on the smaller side, so you might be convinced to order two at a time -- we won't judge. 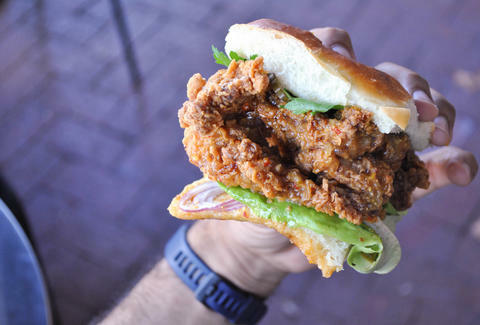 A modern take on the classic Southern chicken biscuit, this one is a standout: spicy fried chicken covered in sauce and served with pickles, Bibb lettuce, parsley, and red onion on a soft roll. The sauce -- the recipe's a closely guarded secret -- is sweet and tangy, reminiscent of aioli, while the pickles give each bite a little tartness. Do yourself a favor and head to Pineapple and Pearls for this bad boy. 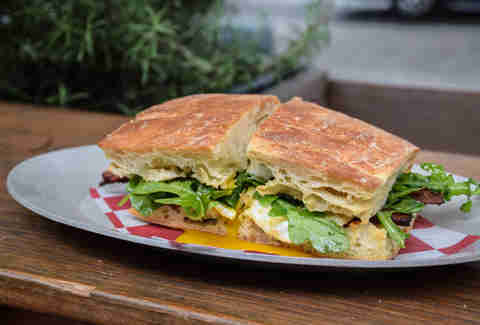 OK, this place is kind of a hike, but this sandwich is totally worth it: ciabatta, stuffed with a fried egg, apple butter, gorgonzola spread, arugula, and bacon (you can get it without the bacon, but… why?). The ciabatta is fresh and crusty, and baked perfectly -- you could be happy eating a loaf of this just by itself. The fried egg is served over easy, and balances out the creamy, bold nuttiness of the gorgonzola spread -- this is definitely for folks who enjoy a stinky cheese -- but it's not overwhelming. The arugula's bitter, the apple butter's sweet, and the whole thing comes together just beautifully. Jose Lopez-Sanchez is a writer, improv comedian, and former dairy farmer. Follow him to Dodge City at @JRLopez.